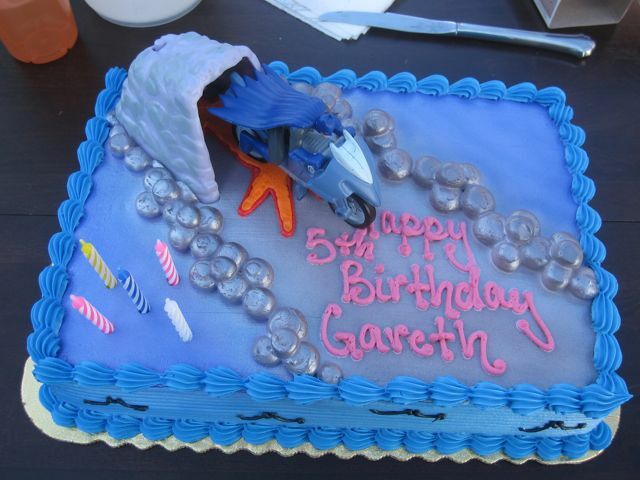 We got lucky this past weekend and had beautiful weather for Gareth's birthday party on Saturday. We opted for having it outside. Due to spring break, only three of the six friends we invited were able to make it which was just fine as it kept things a bit more manageable. Gram finished the tent she was making for his birthday the night before and the kids loved playing in that. My siblings and I had one of these as kids and it's looking like Gareth and his brother will enjoy theirs just as much as we did ours. A great thing about young kids is that they're so good at entertaining themselves. They were content to run races and play with the tent and all our soccer/bounce/basket balls for the most part. 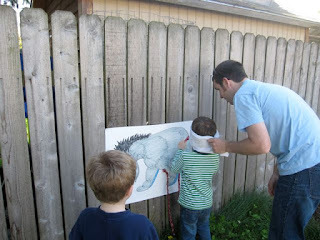 We did play pin the tail on the donkey, though without making any of the kids dizzy first which definitely helped their tail placement success. 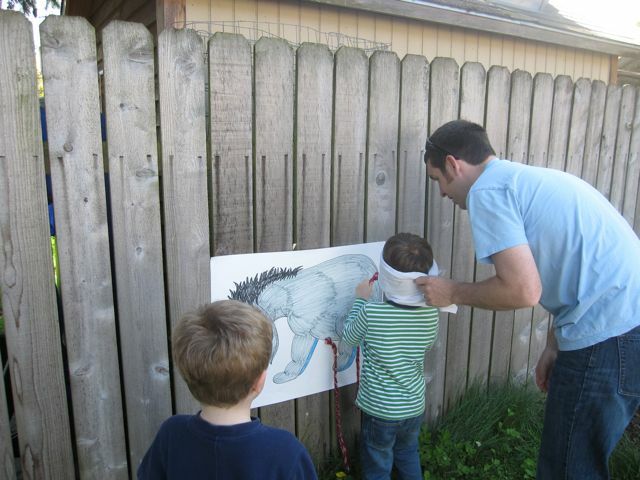 But considering we had a two and a three year old playing as well it seemed best to leave out the disorientation. The cake we purchased at the Central Market bakery on the recommendation of a friend from clarinet choir. It was a good choice for a kid's party, since children don't have highly developed taste, but not as amazing as the cake from Simply Desserts that my mom had treated us to a few days earlier (we'll get one of these for my birthday I think). We made it better by requesting whipped cream frosting (can't stand the nasty shortening stuff). It was a good cake, just not amazing. Gareth chose a Batman theme for the cake, with the writing in pink (one of his three favorite colors right now, the others being red and green). The only problem with being outdoors was the breeze that made lighting the candles tricky. In the end someone held up a blanket long enough to get the candles lit and for Gareth to blow them out. After cake and presents we let the kids play some more while the adults visited. Gareth also got to celebrate his birthday at preschool the week before the actual event. His teacher makes a big deal out of their birthdays. Everyone in the class signs a card, one of the parents makes a crown for the birthday child, they sing several versions of "Happy Birthday", get to sit on the "big cheese" pillow at circle times, and get to pass around pictures of themselves as a baby/toddler, and even blow out candles on a "cake". I forgot to take my camera that day, so had to settle for a shot of him with his card and crown here at home. His crown is perfect for him - a combination of jet plane and batman stickers as well as "beautiful things" like fairy stickers, sparkles, etc. Our birthday gift to Gareth was a pedal bike. He's loved the Strider we got him last year, but we've now extended the seat (which was already an extra-long one) to its maximum height. 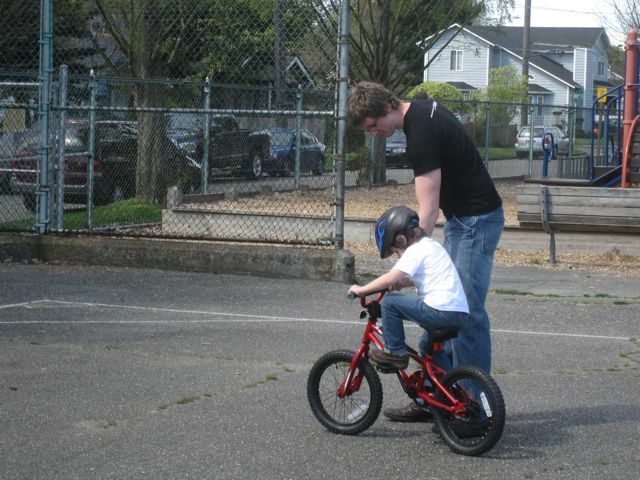 He's been doing so well balancing on the Strider that we decided he was ready for a pedal bike. Sunday we had another gorgeous day so we headed down to our local bike store to see what we could find. 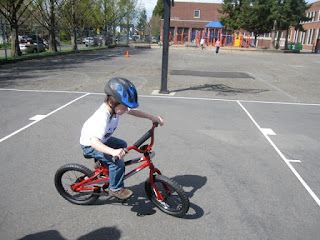 We took a 16" bike out for a test ride and it seemed to work pretty well. Hopefully he'll get several years out of this bike, but it will be a good investment no matter what since we'll use it for two kids. We had them remove the training wheels before we brought it home. 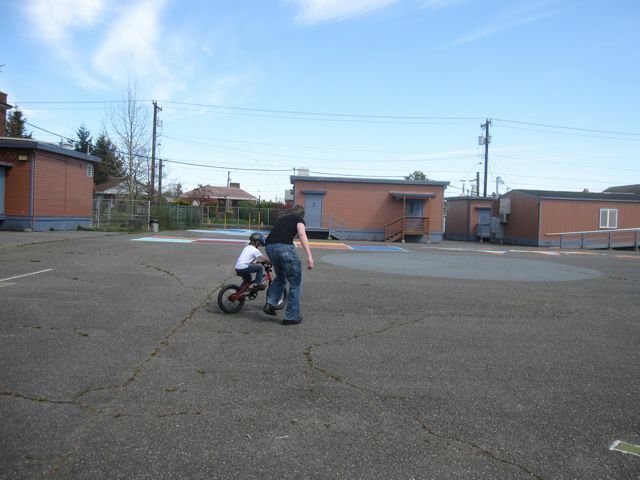 A little later we were off to the elementary school playground to see if he could transfer his balancing skills from the Strider to his new bike. The Strider was worth every penny we paid for it (especially considering we'll use it for two kids)! 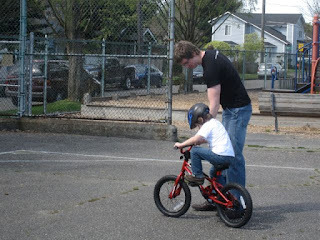 He still needs some practice getting himself started, but I was surprised at how quickly he was riding on his own. Hills, both up and down, will probably require some more practice as well as braking since his reflex right now is to put his feet out to brake. But with a few more days of good weather I'm sure he'll get the braking thing down at least. Gareth really wants a bell for the bike, but Ryan was smart and pushed not to get one now. I realized it would be good not to have the distraction of a bell while trying to work on figuring out how to ride properly. Plus, they're a bit pricey. I told him he can ask for that for Christmas, figuring by then he should have the riding aspect down really well. 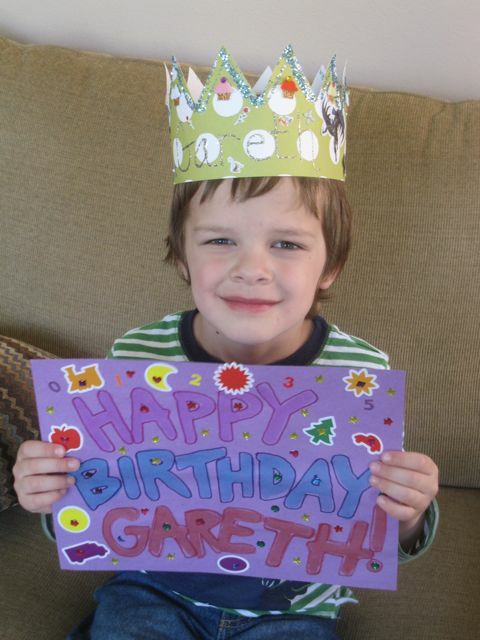 Happy Birthday, Gareth! That is completely awesome that he's riding a bike without training wheels.